There is no place quite as spectacular as the amazing natural wonder on the edge of the USA and Canada. It is estimated that Niagara Falls is 12,000 years old, formed when glaciers melted to form the Great Lakes, and an enormous amount of water powerfully streaming downhill from Lake Erie to Lake Ontario. That massive flow created a river that rushed over a steep cliff and became these powerful falls. When was the last time you were there? Things have changed. The American side used to be virtually barren and desolate, rustic, not very touristy, and park-like. The Canadian side was different. Restaurants, fast food, hotels, activities, action. A mini Vegas. Today, the US side is still more tranquil. It is not tacky. There is one large casino – the Seneca Niagara Resort & Casino – a museum, an aquarium, and the town is generally family friendly with some events like concerts, outdoor movies, and fitness endeavors. There are hiking trails and you can get back to nature. There is tourist access really close to the top of the falls. The water is not as noisy as the Canadian side, and the variety of the views are somewhat limited – but still a very impressive place to experience the beauty and wonderment of the falls. The Canadian side was always more built up and livelier, a true contrast to what the United States was. Today, it is even more so. It’s a glitzy, more urban environment over in Canada. Everything is flashy and there is much more activity and things to do. You will find so many places to eat and there are two large casinos, Casino Niagara and Fallsview Casino Resort – both with spectacular views, shows, gaming and late night activity. You can see many panoramic views of the falls from different angles, and really capture the true sense of the enormous power of nature in motion. It is a long drive to get there, all the way to the Northwest upper portion of New York State. The good news is that travel is predominately on the Thruway and thus smooth sailing to get there – especially when you travel on a modern, luxurious charter tour bus. Temperature controlled, comfy spacious seats, entertainment system, and the best view of the excursion right out your window. Traveling by charter bus is also great because you can schedule all the best stops along the way. Your group can plan an overnight in Albany to break up the trip by visiting the capital of New York State – where there are many museums, and interesting governmental buildings along with concerts, hockey and basketball games, art and culture. Also along the route are so many little attractions and special lunch and dinner spots. It makes the trip unique and interesting, and allows you to soak in much more than you would when taking a non-stop flight or train ride to your destination. And once you arrive at Niagara Falls, you will be driven by your courteous, professional driver right to the door of your chosen hotel. Coach Tours Gets You There the Best! 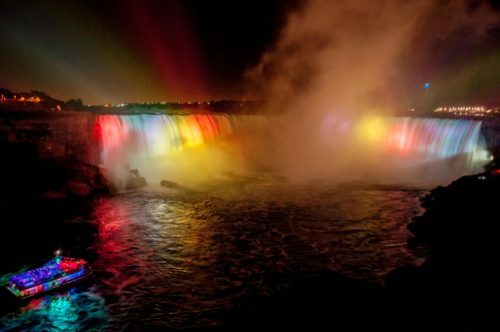 Just like there is nothing else like Niagara Falls – there is also nothing like having Coach Tours get you there. We are the best at it. Our representatives will assist in every way possible to create an itinerary and a charter price that is perfect for you and your group. We have top safety ratings each and every year, and everything from our customer service team, to our drivers, to our luxurious buses, to our staff mechanics are the best they can be. Find out why travel groups make Coach Tours their first call – the best go-to tour bus company to get you where you desire to go.